On Saturday, March 9, the student-led Brown Entrepreneurship Program Women’s Entrepreneurship team hosted the 3rd Annual Women’s Empowerment Conference (WE@Brown). The conference had 300+ registrants, featured workshops, an industry panel, keynote remarks, and a pitch competition. Haley Hoffman Smith ’18, author of Her Big Idea, opened the conference with remarks encouraging attendees to embrace uncertainty. Participants then attended workshops focused on the business of body language to supporting the mental health and wellness of changemakers. Jeanine Sinanan-Singh lead a discussion on how she raised over $2M for her startup Vitae Industries. Dr. Taraneh Shirazian, MD, founder of Saving Mothers, provided a hands on workshop on how to start a nonprofit organization. Female leaders also held an industry panel and facilitated conversations about their personal experiences which included a Brown alum founder who created a gender fluid makeup company to a startup focused on improving financial well-being for women. Lisa Caputo ’86, Executive Vice President and Chief Marketing and Communications Officer for The Travelers Companies, Inc., discussed the evolution of her career from serving as the Press Secretary for First Lady Hillary Clinton to founding and leading Citi’s Women & Co. business. After hearing her inspirational story, participants attended another round of workshops including a conversation on the history of diversity in entrepreneurship from a immigrant and racial/ethnic minority lens and business lessons learned from Beyonce. Stephanie Kaplan-Lewis, founder of HerCampus Media, delivered closing remarks, sharing her story of creating a ground-breaking company while in college. 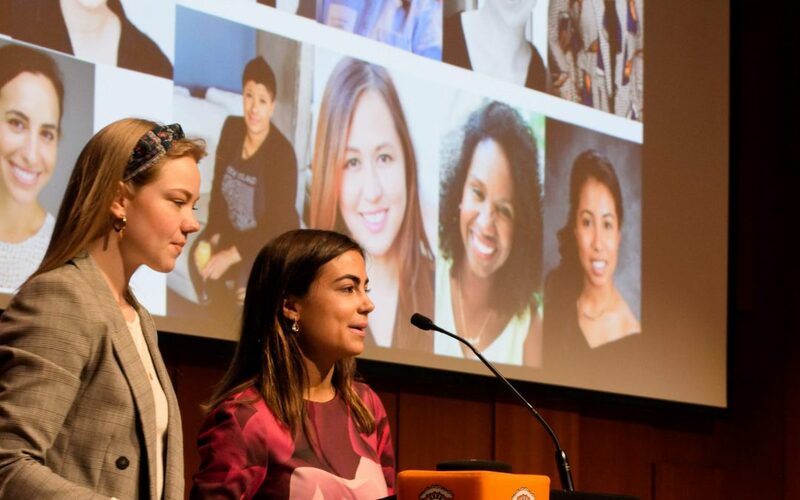 For the first time the WE@Brown conference concluded with a pitch competition featuring female founders from the Brown undergraduate community. Maggie Bachenberg ’22, founder of Pointz, won $500 for her long-distance bicycling planning platform.